Lightning may have caused a three-alarm fire at a home on Silver Glen Road in north suburban McHenry. Lightning may have caused a three-alarm fire at a home on Silver Glen Road in north suburban McHenry. The family was able to get out safely. No one was hurt. Fire officials said a storm was moving through the area at the time the blaze broke out. Investigators are working to determine the exact cause of the fire. ABC7 Facebook fan Armen Musanovic, of southwest suburban Yorkville, sent in a few photos of what the lightning did to a tree that stands about 15 feet from his front door. "My fianc and I were in the living room when I heard some crash and a loud bang," Musanovic said. He said lightning split the tree in half around 6:30 p.m. Wednesday. The part of the tree that split from the trunk fell on top of his fiance's car, which was parked in the driveway. "This weather is ridiculous," Musanovic said. 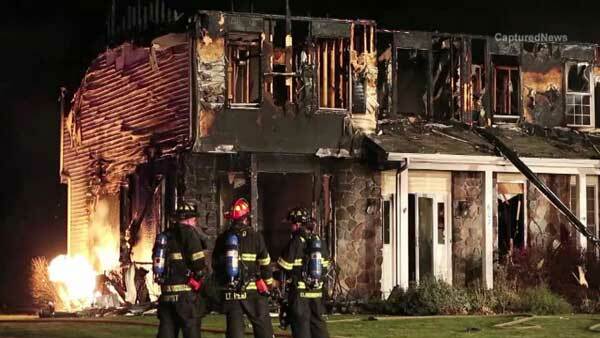 A home in northwest suburban Barrington was damaged by a lightning strike. No one was hurt. Homeowner David Silver said he's lucky it wasn't worse.